3 Blemished Available: From $103.96 This item is available as a Blem/Refurb. These are items that cannot be sold as "New" merchandise and are limited to stock on hand. See the product details for a description of the product's condition. 2 Blemished Available: From $97.46 This item is available as a Blem/Refurb. These are items that cannot be sold as "New" merchandise and are limited to stock on hand. See the product details for a description of the product's condition. 3 Blemished Available: From $77.97 This item is available as a Blem/Refurb. These are items that cannot be sold as "New" merchandise and are limited to stock on hand. See the product details for a description of the product's condition. 4 Blemished Available: From $103.96 This item is available as a Blem/Refurb. These are items that cannot be sold as "New" merchandise and are limited to stock on hand. See the product details for a description of the product's condition. Was in an accident on my bike two days ago. The helmet met the road with some force, took all of it with some scratching but judging from the stars I saw, it absorbed most of the impact and I have NO head injury. 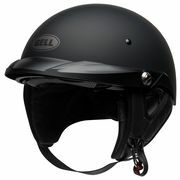 I was looking for low profile and almost went with one of those non DOT skull cap style helmets. I am eternally grateful I did not. I've already ordered the replacement. Glad this helmet was on y head. Size up one size when ordering. I have a narrow head, and few helmets fit well - this one does. No vents, so on a hot day your head might heat-up. Also, the pull-down visor takes quite a bit of effort but does a good job, with clear replacements available. Great, adjustable fit. Appreciate the retractable sun visor and removable cold weather liner. I think it looks great too. Get's a bit warm on hot days, other than that, perfect. Best helmet for long distance! I use a Shoei for short to medium rides. When I ride 300 or more miles, I use this helmet. Much more comfortable. I based my opinion on my personal experiences and on nothing I read. However I do tend to read a lot and study the market before making such purchases. This helmet was everything I expected. I feel it's a good value for the money based on the market, It looks good, fit and finish is excellent and packed with many features. Not sure how it will compare with others in an actual accident or impact and pray I never find out. In the mean time I'll trust what what's been written by those that know. Great half helmet. Like the adjustable sizing. Now my warm weather go-to. I have several helmets most of which are full-face like the Bell Vortex or 3/4 type with drop down shields. I live in the Arizona desert and really wanted a lighter helmet with better airflow for when the temperatures approached and reach triple digits. This Bell Pit Boss fits me perfectly and is very lightweight, so it's exactly what I was looking for. 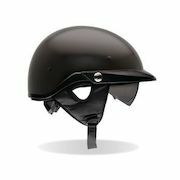 I will still wear the Vortex when weather permits, but when the weather heats up the full face makes me claustrophobic. Other reports claim these fit tight and suggest to order the next size up, but I ordered mine exactly as the size chart said and I'm glad I did because it fits snug, but not too tight. Obviously it is going to be loud compared to 3/4 & full helmets so that isn't an issue at all. Even in the heat with the neck curtain installed it is leaps and bounds more comfortable than a full helmet. One bonus feature was the Pearl White shell because I have a Pearl White 1200c Sportster and it matches fairly well. 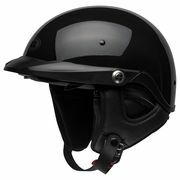 If I had any complaints at all it would be the chin strap seems to be a bit further back than my other helmets and pushes on my windpipe when it is tight, and the drop-down shield barely touches my nose. I purchased the clear shield so I could wear sunglasses and five minutes with a dremel tool fixed the shield to keep it off my nose and it clears my sunglasses just fine. The drop down shield is spring loaded and operates perfectly for me. Overall I am very happy with the helmet and will be using it every summer in the future. This a great helmet. But it runs very small on sizes. I normally wear a medium but I ended up getting a 2 XL. I would highly recommend this helmet. Pit Boss is the "BOSS"
What have I been missing all these years!!!! My long A$$ oval egg head is hard to fit and always has hot spots no matter the type of helmet. Thought I would give the Pit Boss a try and discovered that there is a helmet out there for egg heads that fits like a dream. The Speed Dial adjustable fit system is the ticket....... Thanks for the review videos, helped make the decision.